This bike mount can be fitted to Motorcycles handlebars with a diameter between approx. 21mm – 30mm. The Motorcycle mount has a rubber grip inside to help with securing it safely on the handlebars. There is an easy-twist screw to tighten the bike mount to the required size, making it easy to mount without any tools. 2 Amp Waterproof Hardwire Cable with Waterproof USB Type C Adapter Cable for Samsung Galaxy S8( Optional ) – The cable is simple to set up, the black and red connectors attach to the battery, then run the cable / switch box to a suitable location. The cable includes an inline blade fuse (easily replaced if required) with waterproof cover. 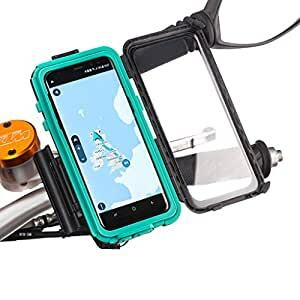 Din Hella Waterproof Charging Cable with Waterproof USB Type C Adapter Cable for Samsung Galaxy S8( Optional – The cable is simple to set up, the male DIN connector simply slots into the existing female din socket on the motorcycle, then run the cable / switch box to a suitable location. The cable includes an inline fuse.